Your doctor may perform a physical exam and blood tests. A hollow biopsy needle will be inserted into the bone. The needle will be twisted and advanced. This motion will allow a sample of bone marrow to enter the core of the needle. The doctor may need to use a fair amount of pressure and may need to rock the needle. The needle will then be removed. The bone marrow sample will be inside the needle. Pressure will be applied over the puncture area. A bandage will be applied. The bone marrow specimen will be examined by a pathologist. Ask your doctor when to expect the results. Bone marrow biopsy – How Long Will It Take? 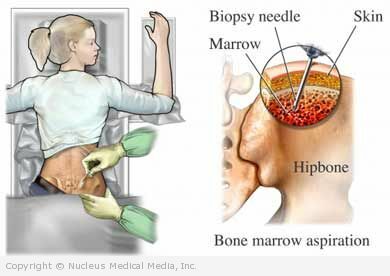 Bone marrow biopsy – Will It Hurt? The injection of anesthesia may sting or burn. You may notice a sensation of pressure and/or pain when the biopsy needle is rocked. Once the biopsy is done, you may feel soreness in the area for a few hours. You should be able to resume your normal activities after your biopsy. If you have had a sedative, avoid driving or operating equipment until the effects of the medicine have worn off. Be sure to follow all of your doctor’s instructions.